The classic Saab 900 has been steadily increasing in value for quite some time now and with good examples becoming harder to find it will continue to do so. Though today they still are a relatively cheap classic. Descent examples start from about EUR 4,500. For this money, you get something that will definitely make those weekend or even daily trips a very special occasion. Built from 1978 to 1993 they were offered in total with 11 engines. All 2.0-2.1 -litre slanted inline-fours with cast iron blocks and aluminium heads. Offered with 8 or 16 valves, single or dual carburettors, naturally aspirated (N/A), turbo, intercooled turbo, etc... Basically, there were always two variants – the naturally aspirated and the...the turbo which had one of the most successful turbo ad campaigns to this day. The ads created an impression that Saab is definitely in touch with its aviation roots and that it's very unlikely you will meet anything faster on the roads. Though the difference in characteristics between the turbo and the N/A are not that big: the N/A sprinted from 0-100km/h in around 11.4s and an early turbo did it in 9.5s. Top speed was 175km/h and 202km/h respectively. The biggest difference is that the turbo has quite a lot of low-end grunt and a punch when the turbo spools up, which encourages to be driven fast. Whereas the N/A also being a descent performer in the 80's standards was more of a cruiser. With its soft suspension and low interior noise it's a pleasure to take on those long trips. 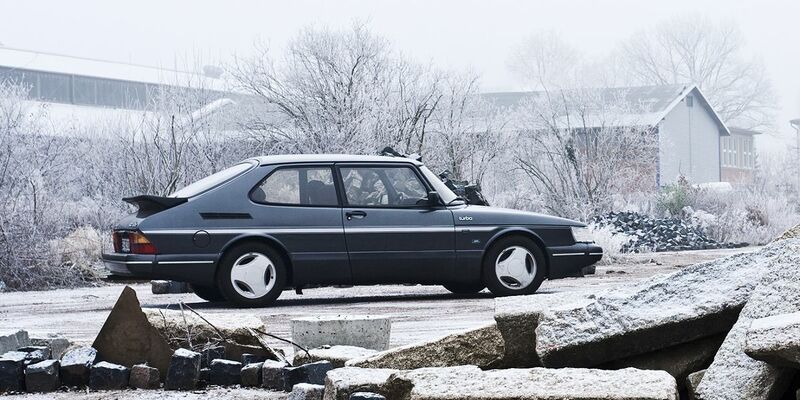 Speaking of long trips – the Saab 900 although might look small – it can easily accommodate 4 adults with their luggage. Of course, one might say that no four people blessed with vision would want to climb inside this cheese slice-interpretation of a car. The aerodynamic design has always been controversial. Though it's one of the features that makes this classic more unique. Some other unique features include a backward mounted engine and a gearbox attached to the bottom of it like a Mini or a Ferrari Testarossa. Power from the engine to the gearbox is transferred by chain which then reaches the wheels by equal length axels. All of this helps to prevent torque steer and adds interior room. It also adds an extra headache regarding maintenance, but like mentioned above – all of these quirks in the end will bring a big smile to the driver. The Saab 900 is mostly known and recognized in its hatchback form but the cabriolet is also quite an icon, only the sedan is something that not too many know existing. Model desire usually puts the N/A sedans at the lowest demands followed by the N/A coupes and cabriolets. Prices begin from around EUR 2,500. Turbo versions rank in about the same way except that hatchbacks and cabriolets are about as desirable. Prices start from EUR 3,500 and can reach up to ten times as much for spotless examples. There were also quite a few trim levels and special editions. Some more interesting facts regarding this matter are that the Aero – the fastest Turbo models with 162hp – where called the SPG (Sports PackaGe) in the US. All of these Aero/SPG prototype models where painted in pearl white which later proved to be a difficult color to repair and therefore most of them ended up under the crusher, but a handful still remain in the hands of collectors. An even rarer model, with only two remaining is the 900 Safari estate. Though these were built by Nillson Special vehicles—a Swedish limo company. The predecessor Saab 99 has a lot of similarities with the classic 900 where as the second 900 generation, referred as the 900NG is based on the Opel Vectra and has a simple transversal front engine and gearbox layout. It's a quite a different car which is said to have many improvements over the classic, but to an enthusiast, it's a 900 with only the easy-to-digest Saab features left in it. Never the less would still recommend it as a more interesting daily driver.